A national survey conducted by the Afterschool Alliance has distinguished California as the leading state in after school programs with strong student participation and high program satisfaction among parents. “These programs are helping our children learn and stay safe after school, while helping working parents keep their jobs,” said State Superintendent of Public Instruction Tom Torlakson. 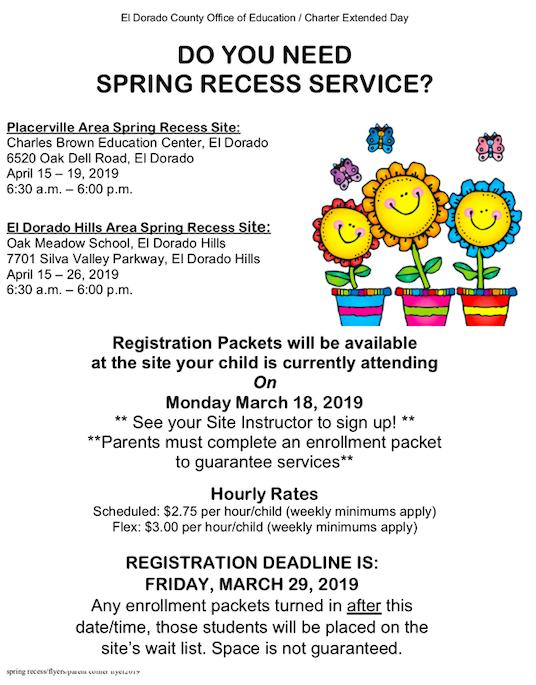 In El Dorado County, students and families benefit from the high-quality services provided by public education and community based child care programs. One example is the El Dorado County Office of Education’s (EDCOE) Charter Extended Day Program, which has provided educationally enriching child care throughout the county since 1984. The Extended Day program represents a unique collaboration with school districts to meet the needs of families, and help students excel by allowing them to continue learning after the bell rings. Extended Day provides a safe and engaging learning environment before and after school to 2500 students enrolled in El Dorado County public school districts on 23 different school sites, allowing students to go back and forth from school to Extended Day without transportation. Extended Day’s services are also available during school vacations, including a robust summer program.